My back has still been hurting, a lot. And the only thing that aggravates it is sitting. I can achieve some comfort by using two cushions to take the pressure off my tailbone and support the lumbar. But this is annoying for two reasons: 1) even with the cushions the pressure hurts at some point; and 2) it’s so bad that I have to use the cushions every single time I sit, so I carry them around all day with me at work, even for 30 minute meetings. So, today I’ve raised my desk again to work standing. I’m really determined to do this more often, but for some reason this is challenging for me. Yesterday I was sitting all day, and my back was so sore, and I knew I should stand, but I didn’t, because it felt like too much effort. Silly. Now that I’m doing it, I remember I do actually like it. It feels pretty comfortable. I walk around the office a lot anyway, and usually have a couple of hours of meetings a day where I am likely to sit. My co-worker gave me a tip. He keeps his desk at standing height all the time, and when he wants to sit he takes his laptop to another location, like a meeting room or the cafe. This is a great suggestion, there are plenty of places to sit around here. Stretching helps my back a lot, as does walking. So I also need to make sure I take breaks to do those things in the middle of the work day. Moral of the story: Sitting all day is bad, bad, bad. 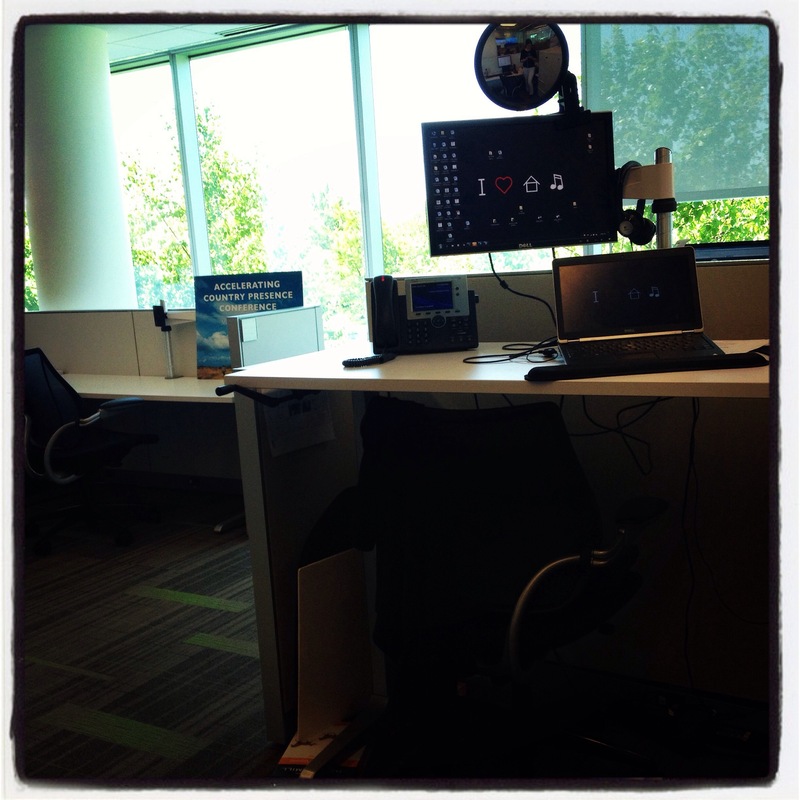 This is a very unexciting photo of my convertible sitting/standing desk. We recently moved to a new office space, which has an open floor plan, filled with cubicles. It’ not as loud and distracting as I thought it would be, and the natural light is amazing, but one of the best things about the move is we all got these desks. I had been wanting a standing desk for a while, so this was perfect. Sitting really aggravates my back pain, even with extra lumbar support on my chair. The first thing I noticed about my standing desk is that it is awesome!! The second thing I noticed is that it is hard!! I tire easily. I need to build up to getting used to it, and if I’m feeling tired (like most of this week) sometimes I don’t even try. But it’s something to work towards. I would like to spend at least a few hours each day standing. I really notice my body working when I stand. I’ll get cold when I sit down, and warm when I stand up. I also feel more energized when I stand up, I can feel it drop the minute I sit down. For some reason it’s easier for me to do short tasks when standing, like checking and responding to emails, but harder for me to focus on tasks that require longer attention. I think this will just take some getting used to. On other topics, we had a gorgeous, sunny, 70 degree day today so I had to walk outside on my lunch hour!! And I got two of my c0-workers hooked on my green smoothie, they both marveled at how fresh and delicious it tasted, and asked for more. Haven’t done yoga since I’ve been home, a week now : ( This week was hard for me to do anything in the evenings because I was so jet-lagged and tired. I hope that next week I’ll be more energized and motivated!